Islam is truly a religion of mercy. Allah (swt) has made it remarkably easy for us to earn righteous deeds. To us, some of our deeds may seem small and insignificant, but to Him (swt) that light deed may be our means of forgiveness, our ticket to Jannah. Not everyone is capable of performing the same deeds. Some may have the means to donate large sums of money to charity, or to perform Hajj. Others may only have the means to donate some clothes here and there, while others may not be able to donate at all. The beauty of Islam is that we are judged based upon our capabilities and intentions, not on the deed itself. For example, Sayyiduna ‘Abdullah ibn ‘Amr (ra) reported That Rasulullah (saw) said: “He who recites Subhaanallah 100 times in the morning and another 100 times in the evening is like one who performed Hajj 100 times!” [Sunan Tirmidhi]. Allah (swt) has created us as equals and He (swt) judges us as such. 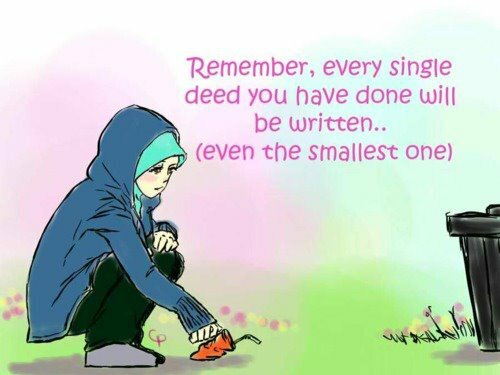 Here are ten easy deeds that can be done by anyone on a daily basis. The Messenger of Allah (saw) said, “On the Day of Judgment, a slave will be questioned about his prayers first. If his prayers are good, his other deeds will be good, too. If his prayers are bad, his other deeds will be bad, too.” [Tabarani, Targhib]. This hadith shows how utterly important prayer is in Islam. Prayer is not only a good deed in itself, but the one whose prayers are good all of his other deeds will be good as well. Thus, the best and easiest way to earn good deeds is by perfecting your fardh prayers. Pray on time, concentrate, make dua, and practice tajweed. Prophet Muhammad said, “A house will be built in Heaven for one who prays 12 Rak’aat in a day and evening as follows: 4 Rak’aat before and 2 after the Dhuhr Prayer, 2 after the Maghrib Prayer, 2 after the ‘Ishaa’ Prayer and 2 before the Fajr Prayer.” [At-Tirmhidi]. Addingsunnah prayers into your day are a great way to not only receive extra rewards, but to fill in the gaps of the compulsory prayers. Because we are human we tend to get distracted and lose focus, therefore, sunnah prayers can be our means of replacing prayers that were invalid. The Messenger of Allah (saw) said, “The best prayer after the obligatory prayers is the night prayer.” [Muslim]. Tahajjud is a struggle that is well worth fighting for. Allah (swt) loves those who give up what they love for His sake. Giving up your sleep and comfort in order to worship your Creator is a sure way to add weight to your scale. “Do good to others, surely Allah loves those who do good to others.” (Qur’an, 2:195) Kindness towards others not only benefits the person on the receiving end but it benefits the one who is being kind by humbling him. Studies have even shown that being kind to others improves ones happiness, subhanallah! The Prophet (peace be upon him) said: “When you smile to your brother’s face, it is charity.” [Al-Tirmidhi]. Is this not the easiest thing in the world to do? Simply by smiling you receive rewards from Allah. Can He make it any easier for us to achieve righteousness? Subhanallah, this is something you can earn many rewards for each and every day. “O you who Believe, make abundant remembrance of Allah!” (Qur’an, 33:41). Dhikr is yet another very easy way to gain good deeds. There are countless hadiths about dhikr and the remembrance of Allah that I can’t mention them all here. A simple one to start off with is to say “subhanallah” 100 times each day; the reward for this is mentioned above. You can also end each prayer with tasbih by saying “subhanallah,” “alhamdulillah,” and “Allahu Akbar,” 33 times each. These are just two small examples of the many forms of dhikr mentioned in the Qur’an and Sunnah. Umar b. al-Khattab narrated that the Prophet (saw) said: “Deeds are [a result] only of the intentions [of the actor], and an individual is [rewarded] only according to that which he intends. Therefore, whosoever has emigrated for the sake of Allah and His messenger, then his emigration was for Allah and His messenger. Whosoever emigrated for the sake of worldly gain, or a woman [whom he desires] to marry, then his emigration is for the sake of that which [moved him] to emigrate.” [Bukhari and Muslim]. By setting our hearts to the right intentions and proclaiming, “bismillah,” before engaging in any sort of activity, everyday matters such as eating, drinking, bathing, and even using the restroom can turn into acts of worship. Be sure that before you do anything you are doing it for the sake of Allah (swt) and not for any worldly matter. Thie remembrance of Allah (swt) can turn simple, everyday actions into great rewards. “If Allah guides a person through you, it is better for you than all that is on the earth.” [Bukhari & Muslim]. Spread dawah whenever you get the chance. The best way to spread dawah is through actions; displaying the characteristics of our beloved prophet (saw). But you can also spread dawah in others ways through public speaking, writing, and social media contents. Even if you never end up guiding anyone, you still get rewarded for a sincere effort. Aa’isha (ra) narrates that Rasulullah (saw) once said, “One who is well versed in the Qur’an will be in the company of those angels who are scribes, noble and righteous; and one who falters in reading the Qur’an, and has to exert hard for learning, gets double the reward.” [Muslim]. The Qur’an is the authentic word of Our Creator; what better form of remembrance than hearing Him (swt) speak to us? Make the Qur’an a part of your daily routine even if all you can muster is one verse a day. [Al-Bukhari and Muslim]. Wudu is a means of physical and spiritual purification. Be sure to concentrate and perform wudu thoroughly and completely. Wudu doesn’t have to be limited to before prayers, you can do it any time of the day to cool off or relieve anger. It is especially good to do wudu just before going to sleep, as it is said that angles pray all night for the person who sleeps in a state of purity. “Except for those who repent and believe in (Islamic Monotheism), and do righteous deeds, for those, Allah will change their sins into good deeds and Allah is Oft-Forgiving, Most Merciful.” (Qur’an 25:70). Seek repentance as much as you can on a daily basis both through prayer and dhikr (by saying “astagfirallah”). “Why should Allah punish you if you have thanked (Him) and have believed in Him. And Allah is Ever All-Appreciative (of good), All-Knowing.” (An-Nisa, Verse #147). Gratitude purifies the heart and humbles the person. It shows Allah (swt) that we are thankful for everything He has given us and therefore earns us many rewards in this life and in the hereafter. Try adding these simple actions into your daily routine. You can start off by adding one, or a few, and build up the list as time goes by. The rewards we earn by the smallest and simplest actions are so large that they are beyond our comprehension. Allah (swt) makes it so easy for us as He (swt) truly wants to grant us Jannah. All we have to do is prove we want it too. Previous articleGifts – An Effective Recipe of Love!